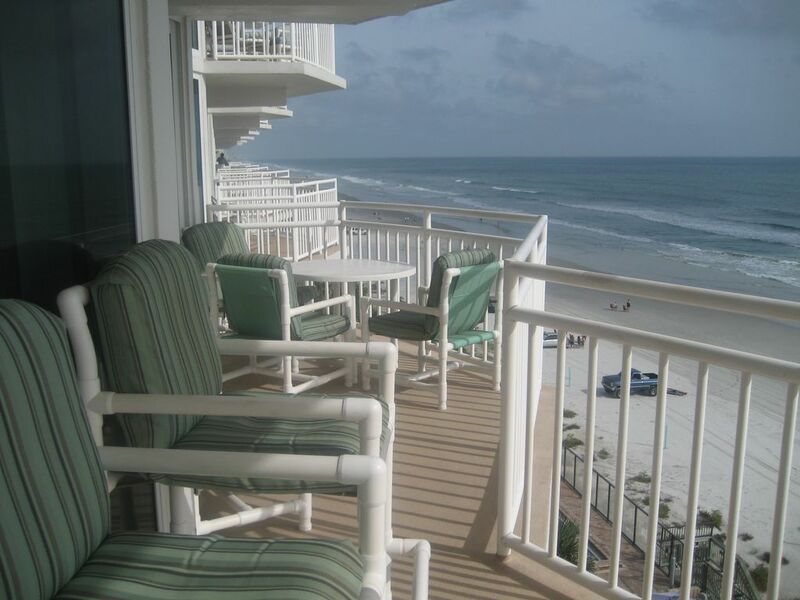 Direct Ocean Front Luxury Condo - Large 3 bedroom 3 bath. Best rates available. Large (1990 square feet), direct oceanfront, sixth-floor unit with balcony from the living room and the luxurious master suite. Remodeled bathrooms to include new fixtures, ceramic tile and granite counter tops. Also remodeled kitchen with new cabinets and granite counter tops. Fantastic ocean and river views from this end unit. Building has an exercise facility with a sauna. Secured building with garage parking. Large formal dining area and large breakfast bar. TV in every bedroom. Exquisite decor and furnishings. This unit has it all. Amenities:: Phone, Air Conditioning, Cable TV (4), Stereo, Full Kitchen, Microwave, Dishwasher, Refrigerator, Cooking Utensils provided, Linens provided, Washer & Dryer, Sauna, Private Pool, Garage. Bathrooms were just recently remodeled to include new fixtures, ceramic tile and granite counter tops. Everything you need to cook and serve a home made meal. Amenities Air Conditioning, Cable TV, VCR, Stereo, Full Kitchen, Microwave, Dishwasher, Refrigerator, Ice Maker, Cooking utensils provided, Linens provided, Sauna, Pool (shared), No Smoking. The washer and dryer are located in the unit. Complimentary Wi-Fi in Unit. Activities and Attractions Biking, Golf, Tennis, Basketball, Fitness Center, Shuffleboard, Miniature golf, Amusement Parks, Fishing, Shopping, Restaurants, Cinemas, Museums, Sightseeing, Swimming, Snorkeling/Diving, Boating, Sailing, Waterskiing, Surfing, Windsurfing, Parasailing, Jet Skiing, Shelling Tennis and basketball courts are located onsite. Near all major attractions. Daytona Beach and Daytona Beach Shores are very relaxing communities with various special events all year long. Some of our more famous events are the NASCAR events at the speedway, Bike Week in March, Biketoberfest is in October, Spring Break, and just plain fun in the sun on the beach! Golf: There are many golf courses in and around the Daytona Beach area.